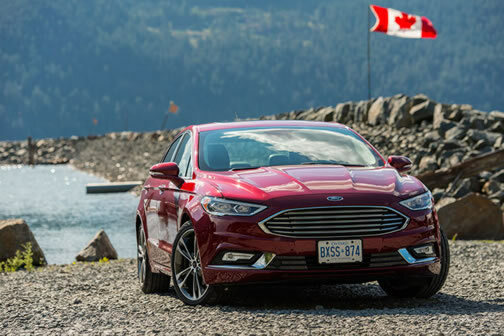 Ford's top selling Fusion has a new look and new capabilities for 2017, and if my all-too-brief experience with the car on its introduction in British Columbia last week is any indication, it should continue to be a popular choice with consumers. Ford of Canada invited me, and a gaggle of other car writers, to sample the 2017 Fusion, which isn't a complete redesign but is still a major rethink of what was a pretty decent car already. Ford has made a number of tweaks they think - and they're probably right - will help keep the car competitive in this bread-and-butter market niche that also features such great vehicles as the Toyota Camry, Honda Accord, Mazda6, VW Passat, Kia Optima, Hyundai Sonata etc. etc. etc. They've continued to pile on technology, too, while also managing to make it easier to use - especially via their embrace of the Sync 3 interface - and they've upped the number of models in the range to include a plug in hybrid version, a couple of EcoBoost engines and a new V6 Sport version with all-wheel drive. We didn't get to drive the latter model, alas, because it wasn't quite ready for us to abuse it, but we did get to look at a decent cross section of the other models. I got to drive two versions, the new top-line Platinum trim level of the plug-in Fusion Energi, which is a really nice interior saddled with a CVT transmission and about two horsepower (okay, that may be an exaggeration), and I drove back from our overnight stop at Harrison Hot Springs in the two litre EcoBoost version that wasn't as high end as the Energi sample, as far as the interior is concerned, but which had lovely power and a nice, six speed automatic transmission with paddle shifters that made it a much more compelling drive. Fusions get a new grille for 2017, so there'll be less disappointment among car nuts when they discover that Aston Martin approaching them is really "just" a Fusion. The grille is wider and looks quite a bit like the new Mustang's (not a bad thing at all) and you can get a Fusion with LED headlights now. They've also tweaked car's bum and basically just freshened the styling a bit - and it works. I always thought the Fusion was a nice-looking car, and while it's still recognizable as a Fusion, it just seems a tad more modern now. The line extends from the base S trim level through the SE and Titanium, to the abovementioned hybrids and the V6 Sport model. And if you want it all, opt for the Platinum trim level and you'll find a very classy interior, unique grille, 19 inch wheels (base models get 16 inchers), and a suite of nannies that's state of the art and (though I didn't really get a chance to test them during our relatively short drives) probably as annoying as they are in other cars from other manufacturers. At least they aren't obtrusive. Nannies include a lane keeping system that uses a forward-facing camera to look over your shoulder, as it were, and decide if you've crossed the line. It'll warn you with either a light vibration on the steering wheel (it'll also do this, apparently, if it thinks you're getting drowsy) or it'll actually turn the wheel for you. I hate these, but they didn't ask me - and they stuck it on because everyone's doing it these days. There's also a blind spot system with cross traffic alert, one of the few such nannies I find handy (especially the cross traffic alert, which works well and lets you know if there's another vehicle or pedestrian about to wander blissfully unaware into your reverse path), as well as an adaptive cruise control system Ford says will actually stop and start the car for you if the vehicle ahead does the same. Ford has also enhanced its parking assist feature, which will actually parallel park the vehicle for you if you're too oafish or cowed to attempt such a manoeuvre yourself. It works well - I once used it to park a big Lincoln SUV into a spot I wouldn't have tried. Now, it'll supposedly angle park as well - backing into a parking space. I didn't have a chance to try this, but I did try it on a Range Rover I reviewed recently, with less success than I'd hoped for (it nearly backed me into a shopping cart corral!). Hopefully that experience was an aberration. Ford also offers a new pedestrian detection system on the Fusion. Or you could just stop texting and pay attention. These safety systems all point the way toward the truly autonomous vehicles that are on the horizon, and I can see a point to them, but in the meantime it seems to me that they just remove any incentive one might have to learn to drive well. This isn't a criticism of Ford; it a commentary on society as a whole. Ford also offers three EcoBoost engine choices for the new Fusion, a 1.5 and a two litre turbo four., and the 2.7 litre V6. I only got to try the two litre version, and it impressed me with its power and torque. It was kind of wasted in the Energi because of the CVT and low-rolling-resistance tires that may help you save Gaia and feel good about yourself, but which take a lot of the fun-to-drive factor out. Fortunately, there are other Fusions for that! And for the lead footed among us, the 2.7 litre EcoBoost is "projected" to put out 325 horsepower and 380 lb.-ft. of torque, which should make it a formidable performer in this market niche. The V6 Sport will also offer continuously controlled damping for its suspension, and includes pothole detection technology Ford says adjusts the shock absorbers "to greatly reduce the severity of impact transmitted to occupants." The Sport exterior features deeper air intakes and a gloss black-finish mesh grille, 19 inch wheels, a rear spoiler and dual twin exhaust outlets. One thing you lose if you opt for a hybrid - the plug-in one, anyway (I didn't check the "basic" hybrid) - is trunk space. Thanks to the batteries a hybrid requires, trunk space goes from generous to "large glove compartment" size. Okay, that's an exaggeration, but the point is valid. Ford says you can recharge the Fusion Energi in only 2.5 hours, but you don't have to plug it in at all - you can drive it like a "regular" hybrid as well. The company also says the Energi is smart enough to know when to start the charging process to get electricity when it's at the lowest price. Ford also says that both of the "electrifying" Fusions can be driven on electric-only power at speeds up to 135 km/h. Inside, Ford has taken a hint from the Jaguar playbook by getting rid of the gear shift lever on the console, replacing it with a rotary knob that makes it easier to reach the storage bins below the centre stack behind it. It's neat and works well, but unless you have a model with paddle shifters it also eliminates the ability to use engine braking when going downhill. Not surprisingly, I was particularly taken by the up market interior on the Platinum model I drove, which includes nice leather and a kind of quilted upholstery theme that's very classy and attractive. It looks like something you'd expect on a Lincoln or other premium car than a "merely mainstream" vehicle like the Fusion. SYNC 3 is Ford's new communications and entertainment system, and it's a great step forward for the company. I'd already tried it shortly before when I drove the new Mustang GT (watch for that review soon) and I like it a lot. It's faster than before, the voice recognition is much improved (you can apparently say "I'm hungry" and it'll give you a list of nearby food outlets, though I didn't try that). The touch screen is more straightforward than before as well, though you can scroll and zoom it like a smart phone, which may not be too wise at highway speeds. Ford still uses the cascading menus on the instrument panel, activated from the steering wheel, but either I'm getting used to them or they've been tweaked as well, because I found them easier to use than before - which is really welcome because I didn't think much of the original version. Ford says it consulted its owner base for the new Fusion, and it appears they even sweated the small stuff. For example, the cup holders have been moved forward, rotated and redesigned for the 2017 Fusion. The rationale was that people use cup holders to carry more than cups of varying size - mobile devices, cash, firearms, etc., so they took this into account with the redesign, which includes "available" ambient lighting. The new cup holders are now one in front of the other, and the front cup holder has been moved six inches forward. This let Ford extend the armrest on the centre console by nearly three inches. They also, taking advantage of the new shifter, added a pocket to the front console that's a nice place to keep your phone or whatever. I don't know if it's a new feature or not, but I should mention the navigation system's ability to steer you around traffic congestion, sometimes. On our trip back to Vancouver airport the system rerouted us around a traffic problem in the city, which was very welcome and handy. It isn't a panacea, though: before we got there we were stuck due to a multi-vehicle collision on the Trans-Canada highway and, later, we got held up again after the Fusion rerouted us around congestion. To be fair, I believe that the issue here was that there were no good alternate routes available in those instances rather than the nav system merely picking and choosing which annoyances to let us avoid. Vancouver can be a tough area to get around at the best of times, after all. I think Ford has done a good job with the Fusion's renewal process. There's enough interesting new stuff to keep the car competitive - let alone at the leading edge in the segment - yet they haven't thrown out the baby with the bath water, since at heart the Fusion was a good car already. Clearly, it still is, and I look forward to getting some seat time in the Sport version when it's available. I bet it'll be a blast!